Do you want to get more email leads from your social media platforms? Social media is a great tool to attract a following, but unless you get those followers onto your email list, you risk losing them all if your account is suspended or deleted. In this post, we’ll share 9 ways that you can use social media to grow your email list. Using social media is a tricky business. You see, most companies fall into the trap of growing their social media following while ignoring their most valuable asset: their email list. It’s so easy to fall in love with the idea of thousands of Twitter followers and Facebook fans… but how much do these numbers actually affect your bottom line? Unless you have access to their inbox, marketing to those leads and making sales is going to be a lot harder. But the worst part? Twitter, Facebook, Instagram, Pinterest, or any social media platform has the right to suspend or even delete your account at any time, for any reason, without prior notice. So if you haven’t converted your followers to your email list by then, you’ll have lost every single one of your leads. Ouch. Tweets and retweeting isn’t the sort of hard-hitting lead generation you might think of for some business, but Twitter chats are a horse of a different color. Twitter chats are designed to bring like-minded individuals together to ask questions and discuss particular topics. A Twitter chat about how to use a particular software, for example, may bring quite a few would-be customers looking for answers or support. When you host a Twitter chat, you’ll not only start a conversation that can build your social clout, but you’ll also be interacting with new Twitter users every time. Naturally, this leads to a dedicated, interested group of potential email leads. To learn how to host a Twitter chat, first attend a few chats in your industry to get a feel for how they work. Then, check out this guide on how to host a Twitter chat. 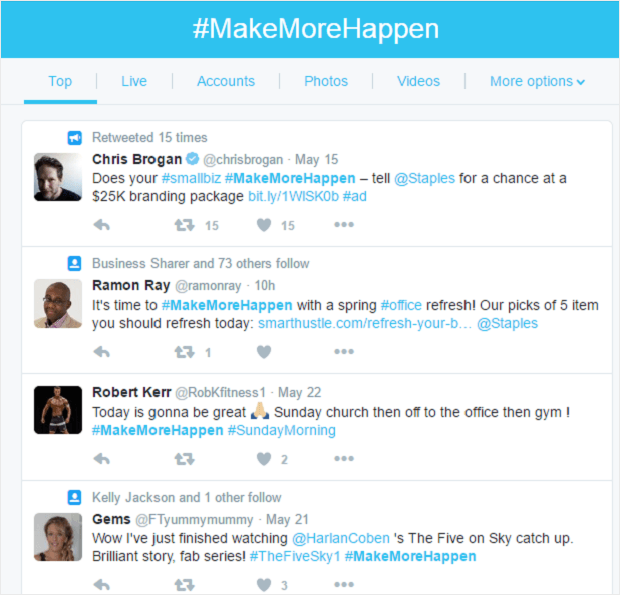 Getting email leads on Twitter will come down to offering value. We recommend creating a free, relevant resource that you can give away during a Twitter chat that you host. You can tweet out the link (at appropriate times during the chat) using the chat hashtag. 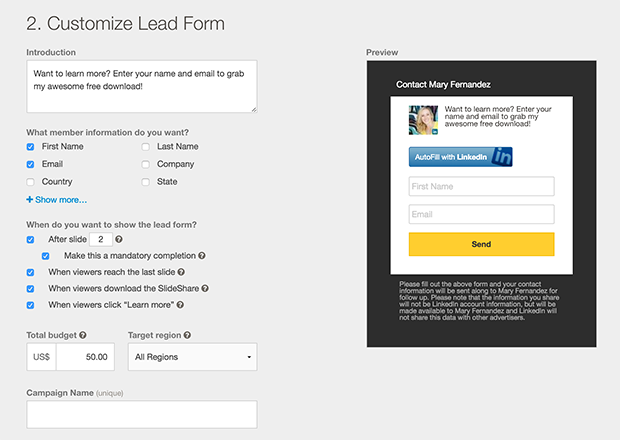 Users would then sign up for your email list in order to download the lead magnet. The fastest way to get email leads from your social media platforms is by spending a little money on advertising. 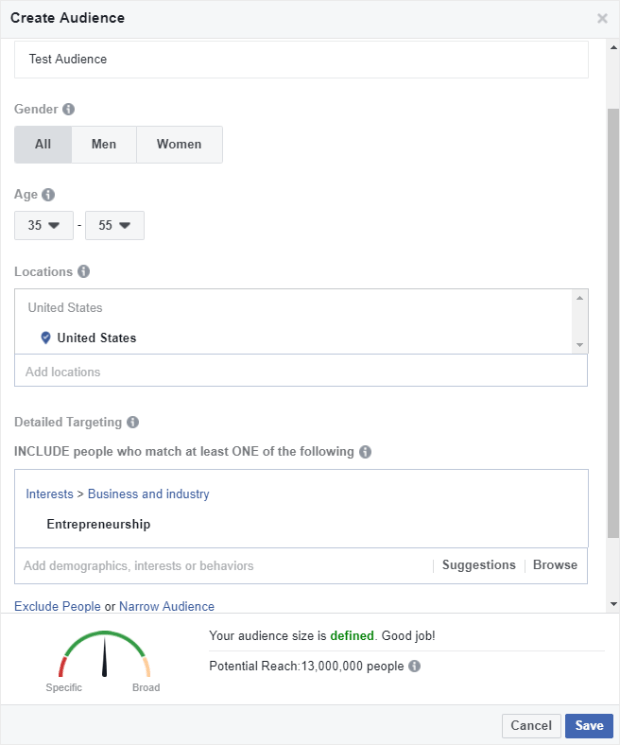 In the case of Facebook Ads, you’ll be able to target your exact demographic, and if your message is right, you’ll see dramatic results almost immediately in terms of gathering leads. Of course, it’s not as easy as putting up an ad and expecting people to click. You have to carefully optimize your ad, your copy, and your image in order to convert email leads. For most lead generation campaigns, this means offering something useful for free in exchange for an email address. To create your ad, go to Promote from the sidebar and then click on Promote Your Page. You can add countries, interests, age, gender and more to find the right people for your ad. We recommend limiting your audience to a single interest or target group to make studying the results simpler later. Once your ad is created, set a low budget initially as part of your testing process and give it a try. Use tracking pixels to follow the leads you’re generating. Give each ad at least 48 hours to run before you analyze the results. Then you can start to tweak and test your ads, and you should be running an effective lead generating campaign in no time. 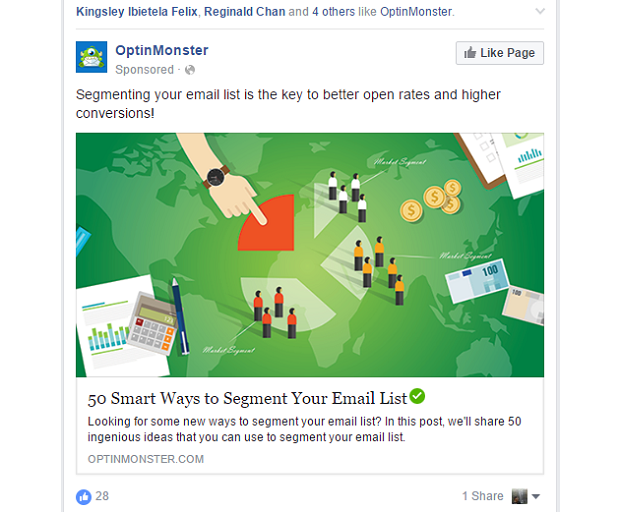 For more information on this strategy, check out our detailed tutorial on 7 Steps to Optimize Your Facebook Ads for Conversions. If you’re not already promoting gated content, you’re missing a very simple and easy method of lead generation. Use social networks and ads to bring visitors to your website. When they get there, block their way with a “gate” requesting their email address before they get to the good stuff. It’s a low barrier to entry, but a worthwhile one for you. But don’t just give your content away for free… give your best content away for free. Make sure that the content you are gating is worth charging $50-$100 for, and then give it away in exchange for an email address. That’s the secret to a high-converting gated article. So why use social media to promote your gated content? Well, gated content is easier to promote on platforms like Facebook and Twitter because it doesn’t look like a traditional lead magnet or sales pitch. It just looks like a blog post. And you definitely do not want your social media posts to look salesy if they are going to be effective! OptinMonster makes it easy to create a gated blog post. All you have to do is login to your OptinMonster account and create an Inline optin form. Under the Optin tab, turn on Content Blocking. Once you’re done, simply embed it in your blog post or content area, and promote the blog post on your social media platforms. LinkedIn is a professional network designed to bring potential employees and employers together. So why not leverage that network to bring would-be clients to your business? The groups on LinkedIn are an excellent opportunity to market and speak directly to others who value your knowledge and skills and build additional professional networks and referrals as well. To get email subscribers from LinkedIn groups, start with an optimized profile that is in line with the audience you’re trying to reach. Want to attract CEOs to your list? Make sure you note you’re CEO of your own company (provided it’s true, of course). Then, set up your own LinkedIn group and spend time nurturing the group every single week. Post articles of your own and great articles from others, and encourage discussion among the members. All of this is laying the groundwork for when the real efforts begin. 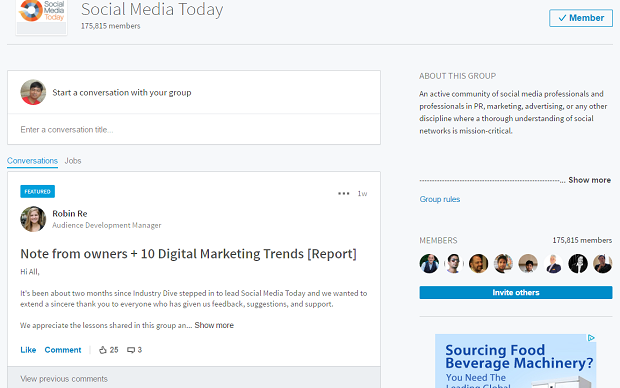 To get members for your group, use the built-in advanced search feature on LinkedIn to find about 500-1000 of your target customers. Compile their information in your own spreadsheet and then begin contacting those targets individually. Connect with your would-be customers and then invite the targets to be part of your new group. Initially, you’ll have to work hard to build the group and make it active with article and discussion. But once it builds, you’ll be in a perfect position to make an offer to join your email list in exchange for something valuable and free (a lead magnet). Don’t forget to also make one-on-one connections with your group members. If you include a link to join your email list on your LinkedIn profile, those people may just join of their own accord. These personal connections are the warmest email leads and often make the best clients. Who doesn’t love a good giveaway? You are seeing these more and more in advertisements from mainstream companies because they work, and they are perfect for small businesses too. First, come up with a hashtag specifically for your contest. Use a descriptive and catchy hashtag that markets your offer with a bit of fun and personality. Then, take a quality photo of the product you are giving away (if you sell physical products, use one of your own to give away). Finally, announce your contest on social media along with the photo of the prize, your hashtag, and a link to a landing page that requires them to enter their email address in order to participate. You can also use a social media marketing tool to set up and promote your giveaway. Some contest ideas include asking your followers to submit a video about what they will do with your product when they win it. Then you select the best video as the winner. Or, you could have them post a selfie of themselves on social media using your contest’s hashtag. The more platforms they share it on, the more entries they will get. Then you select a winner at random. Whatever the contest, make sure it is fun for people to participate. The more you can get people into the spirit of competition, the more social shares you will generate, and the more opt-ins you will get. During your contest, make a point of encouraging your participants to keep going by retweeting and sharing their posts. Let them know that you appreciate their posts, and your contest will have a much better chance of going viral. Virtually everyone with a computer has benefited from a tutorial video at one point or another. Your own video tutorials can be a life-saver for someone trying to figure out how to do just about anything. By creating video tutorials and then ranking them on YouTube, the second largest search engine, you can quickly build a strong following of those interested in what you’re offering. Plus, since YouTube is owned by Google, having a YouTube video helps you to rank higher in Google’s search results as well. The first step to getting traffic from your YouTube videos is to find “how to” keywords that people are actually searching for. Type your keywords into YouTube’s search bar to see the suggested results that come up: those are the search terms that other people are looking for. Then, create a video targeting each of those keywords. After you upload your video, write at least 300 words of content in the description box below the video. YouTube/Google relies on the description, file name and tags to determine what your video is about and what keywords it should rank for. Now that your videos are getting some traffic, make sure that you are creating a strong call to action that will make viewers want to subscribe to your email list! 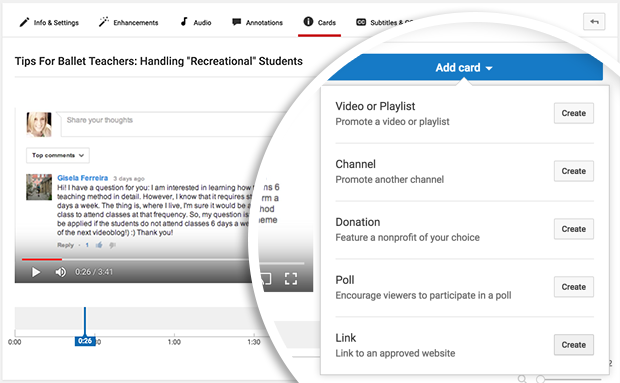 One of the easiest ways to add a call to action to your YouTube videos is by adding call to action cards to your videos. To add a card to your video, go to the edit screen for your video inside your YouTube Creator Studio. Then click on “Cards”. From there, you will be able to choose which type of card you would like to add. Choose the “Link” option to add a call to action to visit your opt-in landing page (you’ll have to associate your website with your account first before you’ll be able to link to it). That’s it! Now, viewers will see an overlay with your call to action right on your YouTube videos. You will also be able to view your cards report to get data on how well your call to action cards are converting. You may already know that SlideShare allows you to take your existing PowerPoint and slide presentations and share them online with anyone who searches for them. But did you know that you can also turn that traffic into leads on SlideShare? 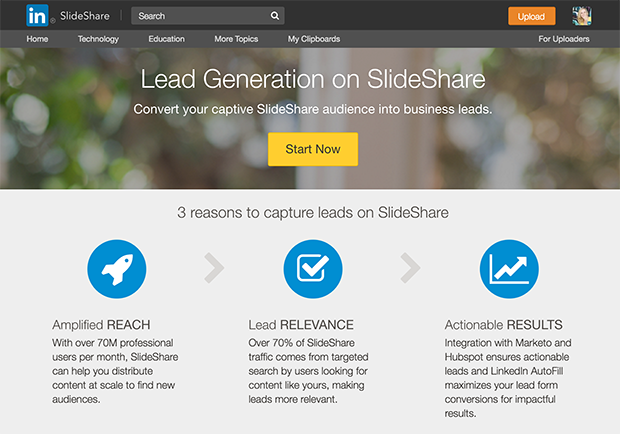 SlideShare actually has a built-in lead generation tool. First, click on Collect Leads from the navigation bar. Then, pick a presentation or upload a new one you’ve created. Next, customize the lead form that is generated by Slideshare to include any information you want to gather, as well as your targeting, lead form placement, and your budget for the project. You can also decide which slide you want the lead form to appear after, and whether you want to make completion of the lead form mandatory or not. If you make completion mandatory, you have turned your old presentation into a new lead magnet! Webinars and live streaming videos are excellent ways to grow your email list. 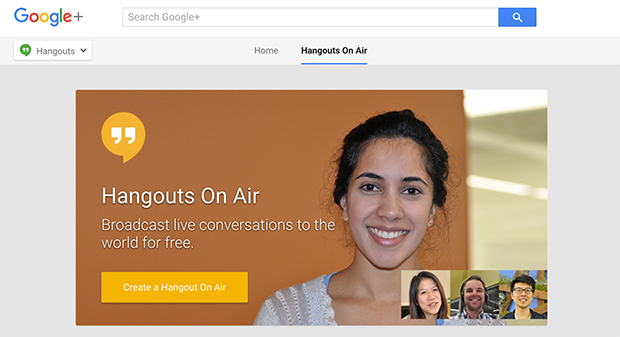 A Google Hangout is easy to take advantage of because it’s completely free to use with your Google account. A webinar, or online seminar, is a chance for current and would-be customers to ask questions and learn from the experts: you. Offer a free webinar on a topic that pertains to your products or services, and one that you know many would-be customers need help with. Promote your webinar, and collect the email addresses of those who sign-up to participate in your free session. Consider adding a trailer or promotional video to the Hangout to show your audience members what to expect in your Hangout from the start. Also, take advantage of the tools that Google Hangouts provide… a Q&A allows you to answer questions that visitors ask. A Showcase gives you the ability to send articles, website and online content to your audience members—especially great if you’re selling something or offering free bonus content. Once your Hangout is set up and ready, invite people directly through Google or embed the link in an email or on your website. You’ll want to do some promotion ahead of time so that your audience is prepped and ready for the presentation. Once your audience is assembled, it’s time to start the show! Click on the Start button in Google Hangouts and then the Screenshare button to show visitors the PowerPoint or presentation you’ve created to show while you speak. When you’re finished with the presentation, you can use the YouTube Video Manager feature to edit and enhance your recording. You can even download this as an MP4 to use in the future. Instagram may not be the first option that springs to mind in terms of marketing and generating leads. However, this medium provides tons of possibilities. On Instagram, you can create short promotional videos, clever marketing slogans, entertaining or silly videos “brought to you by [your company]”… The possibilities are limitless once the creative bug bites. You need only harness that creativity! Whatever you do, just be sure to always include the most important thing: a call to action. You can’t generate email leads if you forget to ask people to subscribe! When used correctly, social media can easily take your business to the next level of profitability. The key is to continue to grow your social media following, but make sure that you are always converting those followers into email leads. This is the step that separates the amateur marketers from the pros. Are you using social media to grow your email list? What strategy or strategies are working for you right now? Let us know in the comments! And be sure to check out how to generate leads on Instagram to add even more power to your social media marketing. Hey, am Uttoran Sen, the CEO and Co-Founder of Guest Crew. Am a full time internet entrepreneur who loves to blog and get busy on the social media. I thought Twitter lead gen cards were dead. Is it just the free version? No, they’re still being used, JoJo. In fact, we mention them in our guide to using Twitter for lead generation.